The recent BBC report on the pay of its top earners laid bare the disparities between men and women's earnings. But it should come as no surprise. The gender pay gap has been stubbornly stagnant over the past decade. According to the EU (which calculates the gap based on hourly pay differences between men and women), men earn around 20 percent more. And the UK's official statistics group, which calculates the pay gap of full-time earnings, men earn an average of about 10 percent more than women. For example, in 2015, 85 percent of women between the ages of 25‒49 without children were employed, exactly the same proportion as childless men employed in the same age group. But women are likely to drop out of the labour market or reduce their hours after childbirth, while men are more likely to increase their hours and increase their labour market participation. The stats show that there is a sharp drop in the employment rate of women with children – to 71 percent – while the employment rate of fathers rises to more than 90 percent . Further, only 16 percent of all women between the ages of 25‒49 without dependent children worked part-time, while this proportion more than triples for women in the same age group with children to 52 percent . It isn't just about working part-time but the quality of part-time work is also a factor. 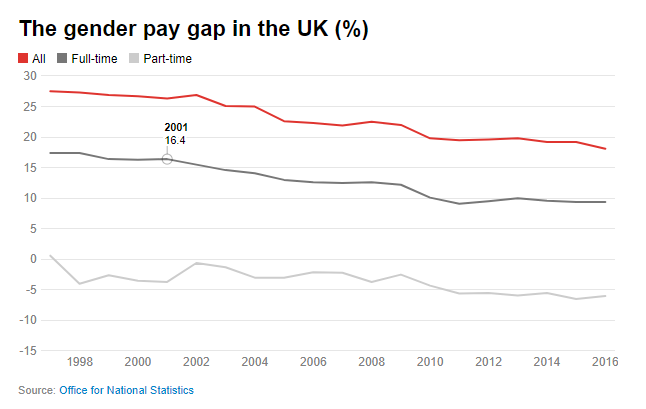 It is widely known that women usually switch to lower-paying, lower-quality jobs when moving into part-time work, due to the lack of high-quality well-paid part-time jobs in the UK . Obviously the more flexibility you have at work the better you are able to shape work around family demands. I myself am a good example of this. Coming back to work from having taken six months of maternity leave after the birth of my daughter, I would not have been able to go back to work full-time if it wasn't for the flexibility I had at work. Given the great amount of freedom you have as an academic to work whenever and wherever you want (within limits), I was able to work full-time by working from home and catching up on work during the weekends and evenings when my baby was asleep or I had other childcare support available. It was hard and I lost a lot of sleep – but through such flexibility I was able to maintain my research career. I wondered whether similar patterns could be observed for other women in the UK. To investigate, my colleague Mariska van der Horst and I used a data set of 40,000 households to see whether being able to have control over when you work and where you work influences women's likelihood of remaining in employment and not reducing their working hours significantly (of more than 4 hours) after the birth of their children. The results were remarkable. As I've found in previous research, not all jobs allow for flexible work arrangements – and they are not necessarily provided to those in most need of them. Rather, they tend to be given more to high-skilled, higher educated workers in supervisory roles. Another recent study found that a large number of mothers are forced to leave their jobs after flexible working requests were turned down. It is not only a matter of justice but also a matter of society's economic prosperity and development to ensure that women are able to remain in the labour market across different stages of the life cycle, including childbirth. 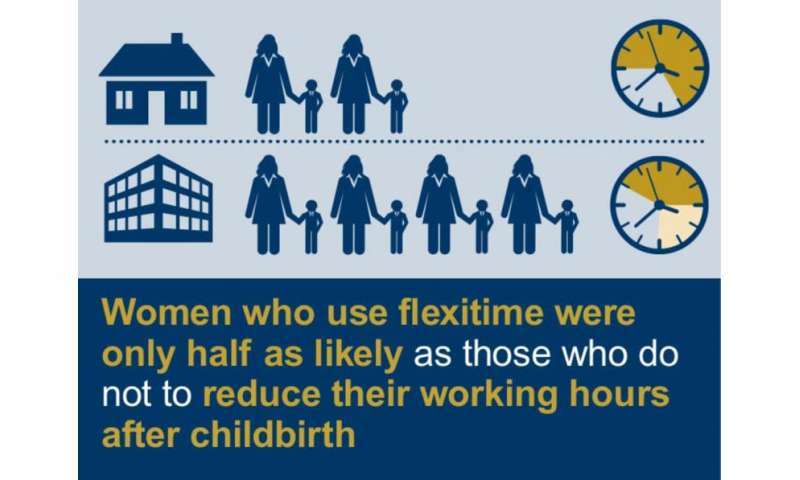 The right to flexible working is crucial if we are to tackle the problem of gender inequality in the labour market – especially when it comes to having a balance at the top of the career ladder. Or we could just accept that men and women are different and always will be and stop complaining about it. Women are just as capable in most roles as men. Men and women just have different goals in life. Hmmm good idea. And the companies that figure out ways around this will enjoy increased production and drive the others out of business. And if they can't they will be driven out of business by companies in other countries. That's what competition looks like. "Given the great amount of freedom you have as an academic to work whenever and wherever you want (within limits)..."
-Many academes don't understand that they're subject to competition as well. Sooner or later the student loan bubble will burst, people will be opting for online educations, and academes will be free to reproduce all they want. want more women in top management,? change the job requirements. make them 8 hour a day, five days a week jobs with limited travel and more time off. more women in the military ? change the requirement, make the packs lighter, the shells lighter. have several people to carry the wounded. oh and by the way, the wage gap is ridiculous propaganda. what is such baloney doing on a "science" site?